Create even more authentic looking wrestling figure matches with our new set! These replicate the barricade that goes around the ring that the audience sits behind. Includes one straight piece and 2 corner pieces, along with 6 clips to attach them together. If you are looking for a bigger set, please take a look at our ultimate wrestling ring barricade playset which is large enough to go around the whole ring! 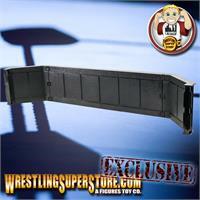 Bash your wrestling figures into the barrier just like real matches on tv! Straight pieces measure 13 inches long, corner pieces measure 5 inches long.